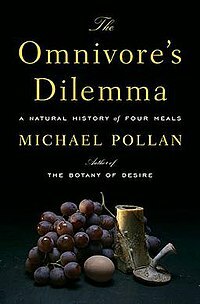 book five: michael pollan’s “the omnivore’s dilemma”. | sara, darling. book five: michael pollan’s “the omnivore’s dilemma”. note: i only had a little bit left of this book when i started reading book four, but i can’t lie: i got a little bored during the 3rd quarter of mr. pollan’s book. i had to pause, then regroup and finish it out. you are, quite literally, made of corn. too many choices does not mean you have to eat bologna and twinkies. ← the very best thing of today, or, i’m sorry my life apparently revolves around food.